Following a thorough veterinary exam at the North Pole, Rudolph and all of the other reindeer have been given the green light to guide Santa’s sleigh once again this year. 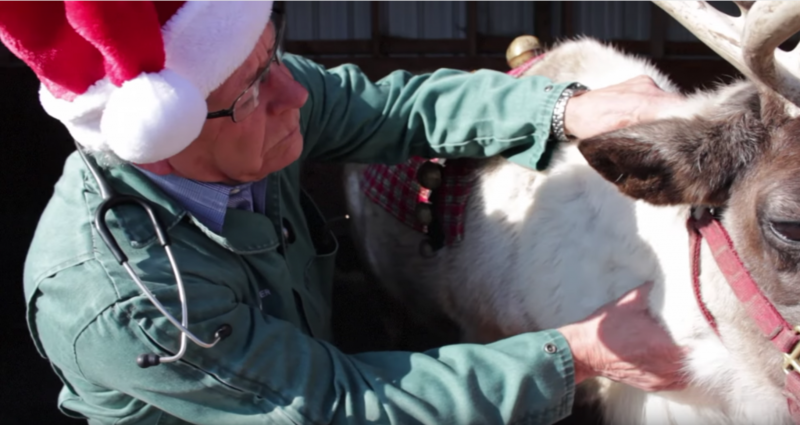 Dr. Tom Meyer, president of the American Veterinary Medical Association (AVMA) and official veterinarian of the North Pole, examined the reindeer earlier this month to ensure that Santa’s team of nine were up-to-date on their vaccinations, free of disease and healthy enough to make their annual trek around the globe. “After thorough examination, I can tell you that Santa’s reindeer are perfectly healthy, in great shape and ready for their upcoming flight,” Meyer said. 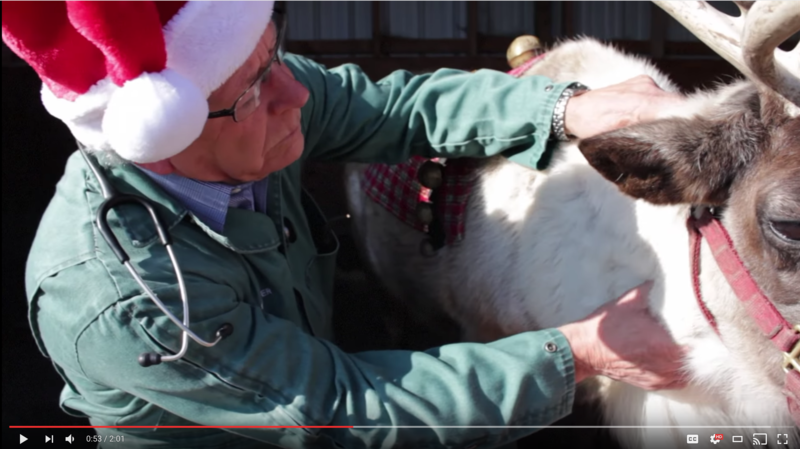 “Twas a month before Christmas, and at the North Pole, Dr. Tom Meyer was about to play his most critical role.” As AVMA president, Dr. Meyer is responsible for making sure Santa’s reindeer are ready to fly. Will they pass this year’s exam? Watch the video to find out! The reindeer’s annual exam includes a health check about a month prior to their Christmas Eve flight to make sure they’re healthy and not showing any signs of disease—such as brucellosis, tuberculosis or chronic wasting disease—that can be transmitted to other animals around the world. In addition to presents for children around the world, Santa is required to bring with him an official “North Pole Certificate of Animal Export” that allows him to freely cross borders and ensure health officials that his reindeer are no threat to animal or public health. Meyer will make a follow-up trip to the North Pole on Christmas Eve to provide a pre-flight checkup and to inspect the reindeer upon their return on Christmas morning. For kids who want to help the reindeer on their journey, Meyer recommended leaving a plate of graham cracker reindeer cookies, their favorite snack, for Santa to feed them between stops. Meyer’s work is consistent with the role veterinarians play every day to ensure the health of animals, people and the environment around the globe. Far from just being “dog and cat doctors,” veterinarians work with all kinds of species, in all types of environments, to make the world a healthier place for all forms of life. While only one veterinarian can be official veterinarian of the North Pole, every veterinarian can help the cause by volunteering to be part of Santa’s emergency veterinary staff on Christmas Eve. AVMA members can download a badge to let their clients know they are part of Santa’s Emergency Landing and Veterinary Expert System (E.L.V.E.S.) support team. Veterinarians are invited to help spread holiday cheer by displaying their official E.L.V.E.S. badge on their clinics’ social media channels and educating clients on the various ways that veterinarians help keep all animals healthy—even reindeer. AVMA members can visit the AVMA website to download the official E.L.V.E.S. badge. For more information on Meyer’s role as official veterinarian of the North Pole, including answers to kids’ questions about reindeer, visit avma.org/santa. For more information about the role veterinarians play in global health, or to schedule an interview with Meyer about his duties as North Pole veterinarian, contact Michael San Filippo, AVMA senior media relations specialist, at 847-285-6687 (office), 847-732-6194 (cell), or msanfilippo@avma.org. The AVMA, founded in 1863, is one of the oldest and largest veterinary medical organizations in the world. More than 88,000 member veterinarians worldwide are engaged in a wide variety of professional activities. Visit www.avma.org for more information.